Precision-etched Tungsten wire for STM mode. Unmounted for Dimension AFMs. These tips are formed from tungsten wire. 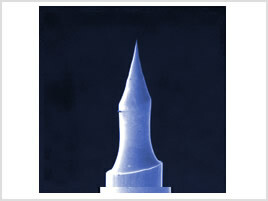 The tip is formed by a computer controlled etch. The wire is 0.25mm in diameter and 6mm in length. Recommended for Dimension SPM. May also be used for Caliber SPM . For MultiMode & Caliber, 8mm tip (Model TT10) is recommended.